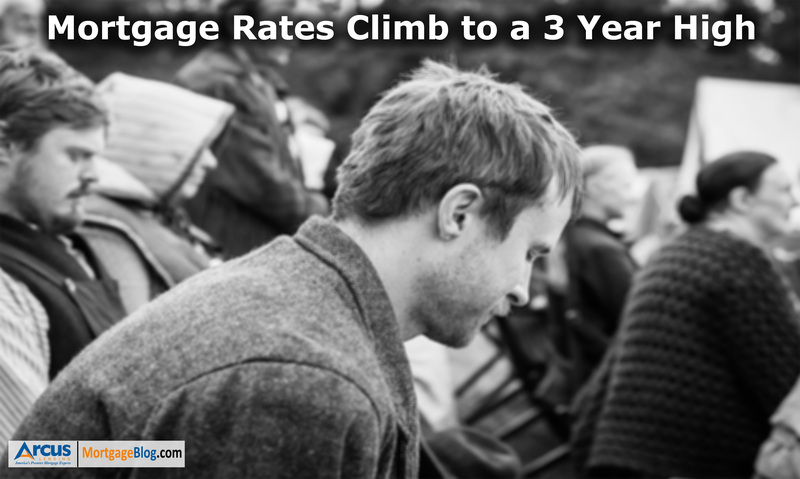 After rising for the 5th straight week, 30-Year-Fixed mortgage rates are now at the highest levels since April 2014. 15 Year-Fixed is fairing even worse; now at the highest levels in almost 7 years. According to Mortgage Banker Association weekly survey, 30-year fixed-rate mortgages with conforming loan balances ($453,100 or less) increased to its highest level since April 2014, 4.50 percent, from 4.41 percent, with points increasing to 0.57 from 0.56. 1 point is equal to 1% of the loan amount. The interest rate for 30-year fixed-rate mortgages with jumbo loan balances (greater than $453,100) increased to its highest level since April 2014, 4.47 percent, from 4.34 percent, with points increasing to 0.44 from 0.40. The average contract interest rate for 30-year fixed-rate mortgages backed by the FHA increased to 4.47 percent from 4.40 percent, with points increasing to 0.69 from 0.68. The interest rate for 15-year fixed-rate mortgages increased to its highest level since April 2011, 3.92 percent, from 3.85 percent, with points increasing to 0.65 from 0.60. The Freddie Mac Primary Mortgage Market Survey reported the 30-year-fixed rate at 4.32% with 0.6 points. 15-year fixed was reported at 3.77% with 0.5 points. What is causing the mortgage rate spike? 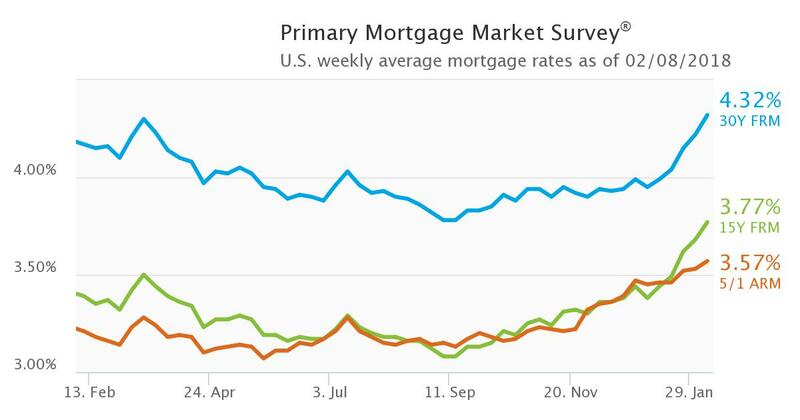 Nothing is going right for mortgage rates right now. A solid economic growth, increase in inflation and expected Fed’s rate increases all put pricing pressure on Mortgage Backed Securities (MBS). MBS is kind of a bond that gets traded on Wall-Street just like stocks. When MBS go lower in price, mortgage rates to borrowers like you go up. MBS has been bleeding this year. See the chart below. Reds are the days when they dropped in price thus increasing the mortgage rates. The bigger the red candlestick, the higher the mortgage rate for that day. You will see greens (which are the days when the rates go down) are few and far between. 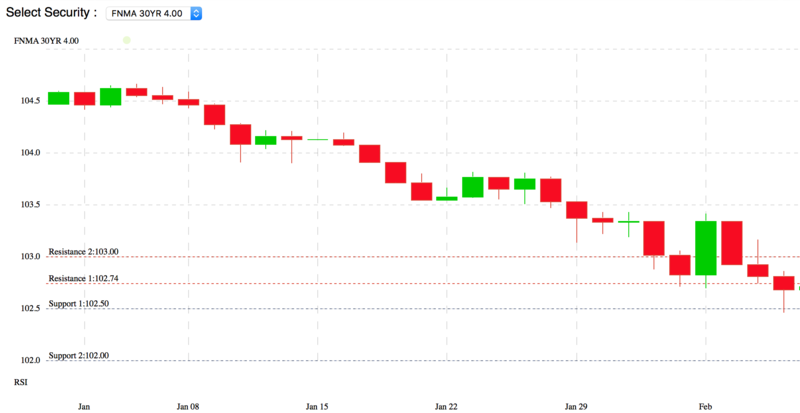 What is the outlook for mortgage rates? As I said, nothing is going for the rates right now. If anything, the trend points to even higher rates in the coming days and weeks. Whether you are considering to refinance or purchase a home, moving quickly and locking your interest rate will most likely be a good move at this time.